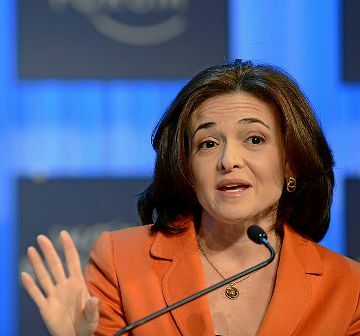 Facebook executive Sheryl Sandberg started a nonprofit organisation, LeanIn.org, to educate, inspire and support women who feel pressured by the media to be skinnier, sexier and prettier. On 9 February, she announced that the organisation would be partnering with Getty Images to create a ‘collection of images that it says represent women and families in more empowering ways,’ instead of showcasing working women as juggling babies in one hand and a briefcase in the other. The new set of photos will show women as surgeons, painters, bakers, soldiers and hunters, and girls riding skateboards, women lifting weights and fathers changing babies’ nappies. Furthermore, Jonathan Klein, co-founder of Getty, expressed how important images have become in the modern age, with apps like Pinterest and Instagram taking up our interest. ‘Imagery has become the communication medium of this generation … that means how people are portrayed visually is going to have more influence on how people are seen,’ he said. The partnership comes at a crucial time for the US, with rumours spreading about Hilary Clinton running for President after she recently appeared on the cover of Times Magazine. It’s getting a lot of people excited and hopeful for the future. Maybe now, instead of a power woman sort of pose with a lady “climbing a mountain” as an image used to depict modern women, we’ll see photos of real-life female professionals and real-life male professionals. This entry was posted in News, World and tagged gender stereotypes, in brief, News, sexism. Bookmark the permalink.